A comedy looking sympathetically at wannabe Jihadists – a touchy subject if ever there was one. IRA voices, bombs on crows and eating your SIM card, this has slowly become one of the best British comedies this century. 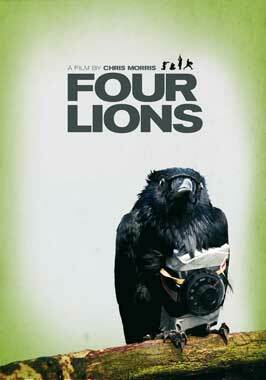 Set in Yorkshire, England, Four Lions follows four wannabe Jihadists as they plan their act of terror. The team consists of idiots Faisal (Akhtar) and Waj (Novak) and controlling idiot Barry (Lindsay), all led by honest family man Omar (Ahmed). Barry and Omar clash over their ideologies, while the rag-tag group struggle to stitch any sort of organised plan together. This is a very cleverly written film. It cannot be easy to get the audience on the side of the terrorists, but that’s achieved straight away. The comedy in the film does have a British flavour, albeit not as strong as I’ve seen in other films. However, the comedy is this film is of awesome quality! I don’t remember the last time I laughed so hard at a film, probably not since I saw Anchorman 2 in the cinema. This is the type of film that has, not necessarily quotable, but memorable moments that have been quoted in British culture ever since this came out. Just the other day one of my friends quoted Four Lions (specifically the bit where Faisal covers his beard), which made me want to watch this film again. That gives you some scope as to how much this film resonates with British people. The acting in this film was pretty good. I liked Riz Ahmed as the lead, but I feel that’s just as much down to the script as it is down to his performance. Kayvan Novak, playing the idiot Waj, is regarded by as one of the most underrated comedy actors in Britain, and it’s easy to see why. Waj, while not necessarily my favourite character, was a very funny person, expertly played by Novak. Everyone else was fairly solid, but more importantly very funny! The directing by Chris Morris is fairly good. The use of grainy video footage which we have come to associate with Al-Qaeda and other extremist groups was very clever, and the artistic style of directing does add another layer of realism to the whole film. Many directors struggle to make an impact when directing comedies, particularly American comedies, so for me to even have some directing to talk about is an achievement by Chris Morris. Overall, not only is this one of my favourite comedies this century, this could, if not should be regarded as one of the most remarkable comedies ever made. A film like Anchorman, a comedy many consider to be one of the best this side of 2000, looks at a relatively innocent subject – news teams. Four Lions looks at the threat of terrorism, an extremely sensitive subject that was at the forefront of British and American minds at the time of this film, from the side of the terrorists! For them to be able to turn terrorism into an honest, genuine comedy is nothing short of spectacular, and I urge you to watch this film.